Zoe - the little ball of pure personality! Several years after my previous kitties passed, I was finally in a position to bring another into my life and home. So one Saturday morning I headed down to the Humane Society to see who was there. I looked at so many cats but none who "clicked". I was starting to think I was just going to have to come back another day when I went into the "Quiet Room", a space set aside for very shy and nervous cats. There, curled up in a box behind a couch was this darling little Siamese. I tried to coax her out, petted her, picked her up and held her for a while. She was quiet, but so sweet and adorable. This was it, I was in love. My heart broke for her when I found out her back story. She'd been thrown away in a cardboard box in a parking lot, then rescued from a high-kill shelter before she found her way to me. I was told she was quiet and shy and it would take her a while to get comfortable and warm up to me. Once I got her home though it didn't take her that long at all. She started exploring right away and as a few days went past and she got comfortable her true personality started to shine. She's exuberant and playful and I've never seen a cat work a room of people quite like Zoe can. I frequently have groups of friends (about 10-15) people over and she'll come dancing out, going to each person in turn, lingering until she gets the proper amount of attention before going to the next. She also loves showing off her 'treasures'; fishing a toy out from under her favorite hiding place (the couch), she'll play and do some acrobatics with it, making sure everyone's seen what great stuff she has before she swaps out that toy for another and repeats it again. She also loves being up high - after retrieving her from the top of the fridge several times I bought her one of those tall climbing trees. Now she can usually be found up on the very top, watching everything go by. 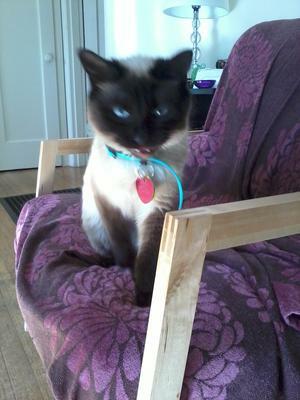 Zoe's not as much of a talker as I've heard most Siamese are, but we certainly do have our conversations. Sometimes I'm certain she understands everything I tell her from her expressions and her range of little mews and trills. I adore this little cat and all joy she's brought into my life - every day I'm so glad I took the time to look behind that couch! Isn't she gorgeous? Thanks, Lori for sharing Zoe's story with us. As you probably know, Zoe means 'life'; she had a very lucky escape from that high-kill shelter and is doubly fortunate to find her way to someone who clearly loves her so much! I hope Zoe continues to light up your life for a very long time to come. 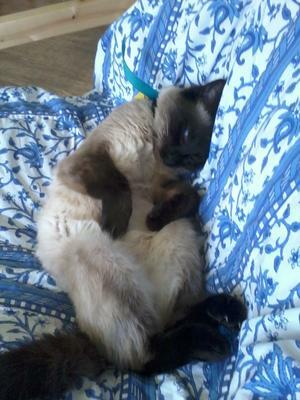 Praia Fluvial; Siamese kitten found!